Like millions of Americans this evening, I tuned into the 7:30 p.m. nationally televised address from President Barack Obama on military operations in Libya. Since news stations had spent the last few days discussing and predicting what Obama would talk about, there wasn't much "new" information in his speech. But when he mentioned Charlotte, it caught my attention. 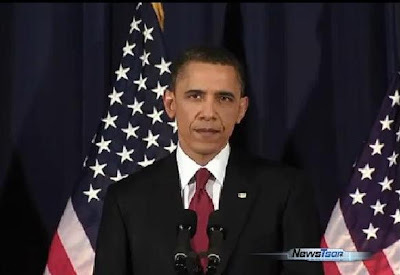 "We knew that if we waited one more day, Benghazi--a city nearly the size of Charlotte--could suffer a massacre that would have reverberated across the region and stained the conscience of the world," Obama said, about six and a half minutes into his prepared remarks. For those of us who live in Charlotte, this is a big deal. First off, the president simply said "Charlotte" and not "Charlotte, North Carolina." This seems to indicate that he expects that you know where Charlotte is. I remember a time when people from other parts of the country wouldn't know if Charlotte was in North Carolina or South Carolina, and would often confuse it with Charleston. Secondly, Obama could've compared Benghazi to other similar-sized U.S. cities like, say, Chicago in comparison to land size, or Detroit for population. Most importantly, perhaps, this continues to show that Charlotte is on Obama's radar. The city is still reveling in last month's announcement that Charlotte will host the 2012 Democratic National Convention. Having your city be a favorite of the United States president can only be a good thing. In fact, The Washington Post published an article yesterday about "Obama rewarding local stations in battleground states with biggest ‘get’ in TV news." The article featured a photo of WSOC anchor Natalie Pasquarella interviewing Obama in the White House a little more than a week ago. Below is a clip of Obama mentioning Charlotte in his speech this evening.